White porcelain Mother Nature's way (no unnatural whiteners or additives). 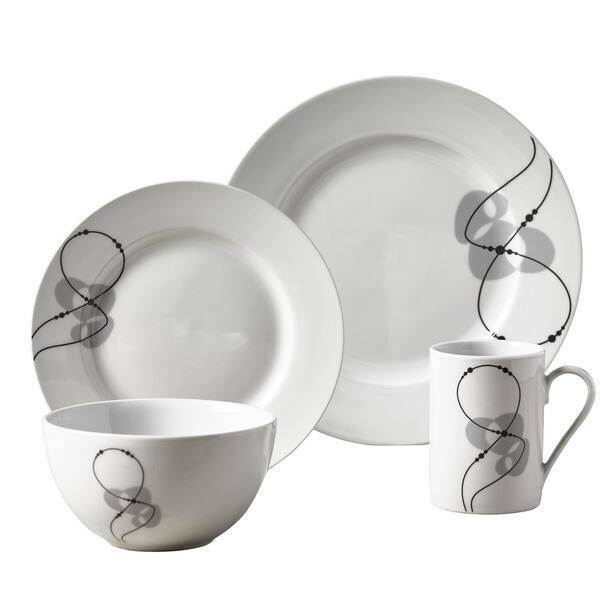 This Jacqueline Porcelain Round Dinnerware Set is perfect for your healthy casual lifestyle. Made from white porcelain as nature intended - with no whitening agents or metal-based color additives, it exceeds Prop 65 and FDA standards. Jacqueline is strong enough for everyday use, yet fashionable enough for casual dining and entertaining. Classic round bodies showcase fresh contemporary Style pattern design for a touch of class that complements any table setting and presents beautifully. Love, love, love these dishes. I love the modern simple sleek design. They are heavy and the depth of the bowls are nice as well as I really like the smaller size coffee cups. Perfect for expresso. We use them as everyday dishes and they have held up well. I haven’t even chipped a coffee cup and that rare for me. Simple and not too heavy. Need some temporary dishes while I start decorating. Inexpensive, but classy. Attractive Temporary set for good price....You need to give better description as to size and weight. "Are these safe in the microwave, many thanks"
Yes, they are microwave safe.